Lindbohm & Partners Ltd. was established in the year 2000 by two friends; Mr. Heikki Lindbohm and Mr. Jarmo Ellonen. It is a true family owned company focusing on sales and marketing of selected wines to Finnish domestic and duty free customers. We provide an excellent partnership in the growing and opening Finnish market. Our wines represent a great quality and taste. Today we work with companies from traditional wine producing countries but also wineries from Australia, New Zealand and South Africa. We are looking forward our 19th year in the wine business. The Wine of the Year 2019 competition was very good to us. Krohn Colheita 1996 portwine won Gold and Krohn 10 years Old Tawny won Bronze. Hugh Hamilton The Villain Cabernet Sauvignon 2016 from McLaren Vale Australia was one of the best New World red wines and received Honorary Award We are very proud of our principals and happy they are making great wines. Happy for Hugh Hamilton The Villain Cabernet Sauvignon 2016, McLaren Vale, Australia being awarded in the Wine of the Year 2019, Finland with AWARD OF HONOUR. This 91/100 points wine is one of the best in the category of New World Red Wines. Congratulations. Hotel KÄMP Brasserie Fall 2018 campaign offers Krohn Port and Cheese Platter € 15,-. It is your choise of French Cheese with Krohn Colheita 2004 Tawny or Krohn Lagrima. Hotel KÄMP Brasserie offers also Krohn Colheita 1982 and in the Cellar Selection you can find Krohn Vintage 1960 and 1970. Wellcome to taste the Fall 2018. You find now high quality Bordeaux red wines in new convenient size 0,375 l bottles in Alko. Fantastic Chateau de Ferrand Saint Emilion Grand Cru 2008 and new vintage Les Hauts du Tertre 2008, AOC Margaux are beautiful and in nice size bottles for one or two. You can buy them in Alko shops or order via new Alko Web Store. Gastro 2018 Helsinki is organized every secound year and is the largest Horeca fair in Finland. Lindbohm & Partners Ltd had own stand in the fair. Grand Champagne 2018 Helsinki, Finland was a great success. Sold out Master Classes and "cream" of the Champagnes were presented to us during three days event. Champagne Armand de Brignac Blanc de Noir 96/100 was one of the rare champagnes presented. Champagne Armand de Brignac Rose 93/100, Gold Brut 95/100 and Blanc de Blanc 91/100 were highly rated by Decanter and Christelle Guibert on November 24th, 2016. Champagne Armand de Brignac is available through Alko stores and Web Store. Hugh Hamilton The VIllain Cabernet Sauvignon, McLaren Vale, Australia new vintage 2014 arrived just on time to Finland before easter Holiday season. Great wine with grilled lam. Viiniopas 2018 rated high 91/100. Organic white wine Chateau de la Jaubertie Sauvignon Blanc 2016, Bergerac, France won Bronze in the Wine of the Year 2017, Helsinki Finland. The new vintage 2017 is as good as vintage 2016. The Flying winemaker Hugh Ryman certainly knows how to make great wine. Chateau de la Jaubertie has been winning gold and bronze during the past years. 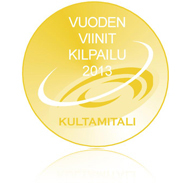 Finnish business magazine Kauppalehti OPTIO selected Chateau de la Jaubertie as best Crayfish Wine three times. Love the quality and taste of this great European wine. Champagne Armand de Brignac Rose, Champagne, France.